We supply Slimlite double glazed units to Joiners, builders and keen DIY-ers, throughout the UK, to put in casement, Crittall or sash windows. There's no need to take the whole window out, no need to replace the box, you can keep your existing frames (as long as they are sound) and, with a little modification, replace the glass with our ultra-thin units. Slimlite was featured on Grand Designs and given fulsome praise by Kevin McCloud; see our brochure for details. We are pleased to announce that all Slimlite double glazed units can be supplied as low-tint Ultra Clear self-cleaning Slimilite. Ultra clear ensures the tinted effect of Low Emissivity glass is not visually apparent whilst maintaining U Values. In addition, units will have a self-cleaning coating applied to the exterior surface. This unique combination makes Slimlite the clearest unit on the market today. It has a Visible light transmission of 85% as opposed to 75% VLT of a standard unit. This is a further step towards making Slimlite as discrete and unnoticeable as possible at the same time as giving you all the benefits of double glazing. Not only is Slimlite very thin, and therefore gives no double reflection, it has a 5mm sightline at the perimeter which means that it will fit the rebate of a 17mm glazing bar. It also complies with the latest legislation governing the installation of new and renovated windows and carries a 5 year manufacturer's Guarantee. We supply Slimlite reproduction "crown" units to recreate historic glass. Finishes, including satin, toughened and patterned glass are also available. Whether you are making new windows or thinking of conventional double or secondary glazing, use Slimlite to conserve energy, to save on heating bills and installation, and at the same time preserve the look of your period windows. To view examples of Slimlite installed by some of our trade partners, please visit our gallery. This is the site for Slimlite, the remarkable new Double glazed unit for timber sashes that is finding favour with Architects, Builders and joiners who seek to gain a competitive edge. Make sure you have given this product the attention it deserves, and you will find Slimlite has lead the way in the industry's response to Document L. Comparably priced, discreet in size and ground breaking in its use of materials, it will deliver savings in timber costs, installation, balancing and making good. Order a sample online, now, and see for yourself. Slimlite Double Glazed Units encompass the latest Warm Edge Technology, Low E Glass and Insulating Inert Gasses and are BS EN 1279 Compliant. They feature small perimeter seals and small cavities which can be fitted into most single glazing rebates. 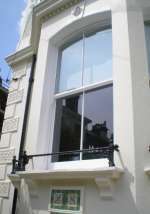 Although originally designed for sash windows with glazing bars, they will fit into any suitable window rebate. New technology Slimlite Double Glazed units are virtually undetectable once puttied into a sash window and are therefore suitable for Conservation or Listed Buildings. Reproduction Crown glass and toughtened glass units are also available.